Synopsis: Upgrade your rotors the right away- and for less than OEM! Usually a set of brake rotors will last about 65-80K miles on a MINI, however depending on how you drive, the type of driving and the type of brake pads you have you could see a LOT more or a LOT less life out of your rotors. Take your MINI to the track and you can burn through a set of rotors in a weekend- and 2 sets of pads. Drive like a little ole lady from Pasadena and you may get 70K miles...but I've lived in Pasadena and I know the roads are steeeeeep going up the mountain and going down requires constant feathering of the brakes to keep your speed down....so anyways. Bad analogy. When it comes time to replace the stock rotors you will have a few options. Buy the factory parts or buy 'aftermarket' parts. We offer both but have found that aftermarket parts often offer better performance and cost less. 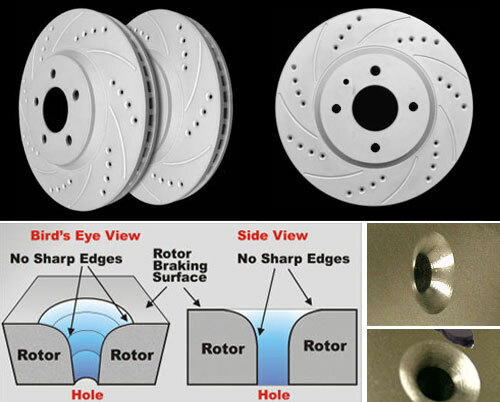 The cross drilled and slotted rotors we offer for nearly all MINI models are a great example of this. They are a great value and offer additional features that increase braking performance while saving money. Consider swapping over to these Cross Drilled and Slotted Rotors for your MINI. Available for front applications and rear applications here. We have replacement Cross Drilled and Slotted rotors for nearly all MINI models including the Coupe, Hardtop, Convertible, Roadster, and Clubman but not for the Countryman or Paceman as of July 2013. Front Slotted Rotors for the MINI and Rear Slotted Rotors for the MINI.